CNN’s Don Lemon was unable to contain his laughter on Wednesday while reporting on a new poll which found 55 percent of whites in America believe whites face discrimination. 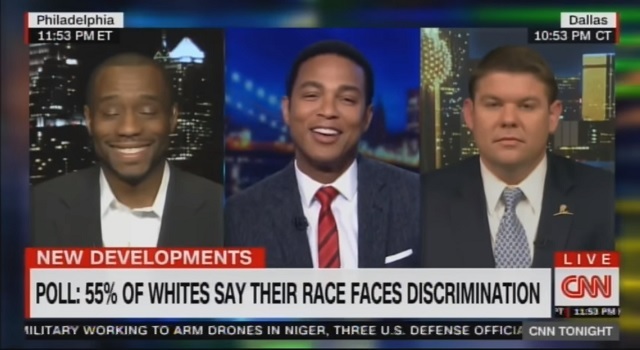 “A new poll shows that the majority of white Americans believe there’s discrimination against their race,” Lemon said while introducing a new segment with Marc Lamont Hill and Ben Ferguson. Hill responded by shaking his head and smiling, at which point Lemon burst out laughing. “White people are amazing,” Hill responded. Hill and Lemon started stammering in response and were unable to form a coherent answer. Contrary to brilliant legal scholar Marc Lamont Hill’s proclamations, white people are systemically discriminated against through affirmative action programs at colleges and in the workplace, as well as through loans and government contracts given only to minority-owned businesses.